The new certification program will ensure that wireless mesh network routers, gateways, and access points from different manufacturers will all work together. The Wi-Fi Certified EasyMesh program that the Wi-Fi Alliance announced today promises to do for mesh networks what the Alliance has long done for wireless networking gear in general: Assure consumers that they can build out wireless home networks without worrying if one brand of device will be compatible with another. The emergence of mesh networking somewhat undermined that effort, because every manufacturer pursued its own path. Wi-Fi is still Wi-Fi, so you don’t need to worry that your smartphone, or media streamer, or home security camera will connect to your wireless router, regardless of brand. But if you buy a Linksys Velop router today, for example, you can buy only Linksys Velop access points if you want to expand your network to cover more areas of your home later. EasyMesh promises to bring to mesh networks the same interoperability assurances that conventional routers have long offered. If Linksys decides to make its Velop product line EasyMesh compatible, and Netgear does the same, for example, you’ll be able to use Netgear’s Orbi Outdoor access point with a Linksys Velop router. That’s important, because to date, Netgear is the only manufacturer offering an outdoor mesh access point—but it only works with Netgear’s Orbi-series routers. 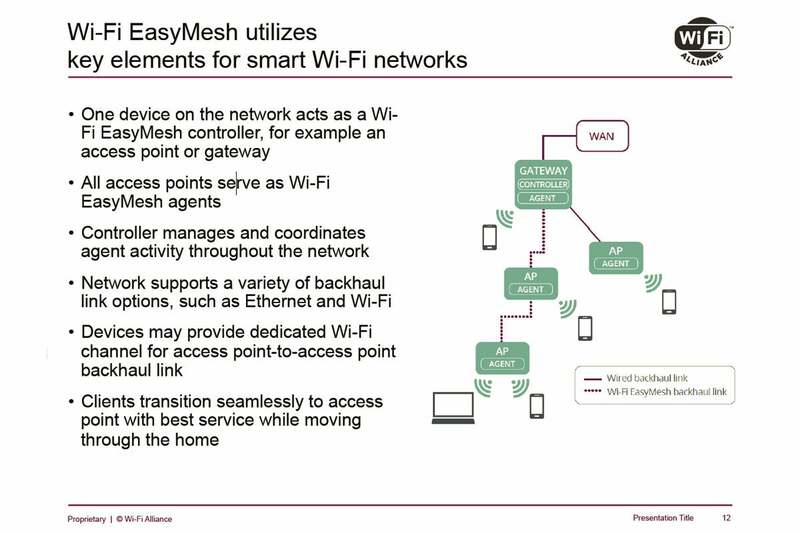 Wi-Fi EasyMesh has two basic components: Agents that monitor and report network and client performance to a Controller operating on one device in the network. The Controller manages network traffic, assigning clients to access points to maximum network performance and efficiency. If one access point gets overloaded, or a client device moves from one location to another where a different access point will be able to service it faster or more efficiently, the controller will seamlessly move that client to another AP. EasyMesh supports both wired and wireless data backhaul, and backhaul can be either shared or dedicated, in which one Wi-Fi link is used solely for that purpose (both the Linksys Velop and the Netgear Orbi mesh routers support the latter). Robinson also said that EasyMesh is implemented in software, “…so there should be no need for new hardware.” But he added that it is up to each vendor to decide about adding EasyMesh to existing products.